As many of you will already know, a lot of planning and prep work is required to execute the perfect styled photo - especially when you are shooting to a clients brief and capturing images of their products. The end result might look effortless but sourcing props and planning each shot can be a lengthy process - not to mention the clean-up afterwards! Your shoot has the best chance of success if you make a plan for all the shots you want to take first. That way you can maximise the output of each scene and get the most out of your props and minimise the time you need to spend shooting. By having a good ol' brainstorm you can take the time to think clearly about a bunch of different ideas before you shoot and have more to work with on the day. That's not to say that everything needs to be planned though, a lot of the best shots happen in the moment and something that looks good on paper may not translate so well in real life. Think of the planning stage as a way to organise all your ideas in the one place so you know which concepts to prioritise during the shoot. Jinny likes to put an extra personal touch on her shoots by making a lot of her own props. These cupcakes and donuts in the image above are decorated to complement a tropical and safari themed party kit. To get this effect you don't have to be a whiz in the kitchen, in this next image you will also see how Jinny has cut out some monstera leaves out of paper which is a simple and clever way to add some serious tropical vibes without much expense. Decorated donuts turn into cute little beetles - perfect for a Safari themed party! 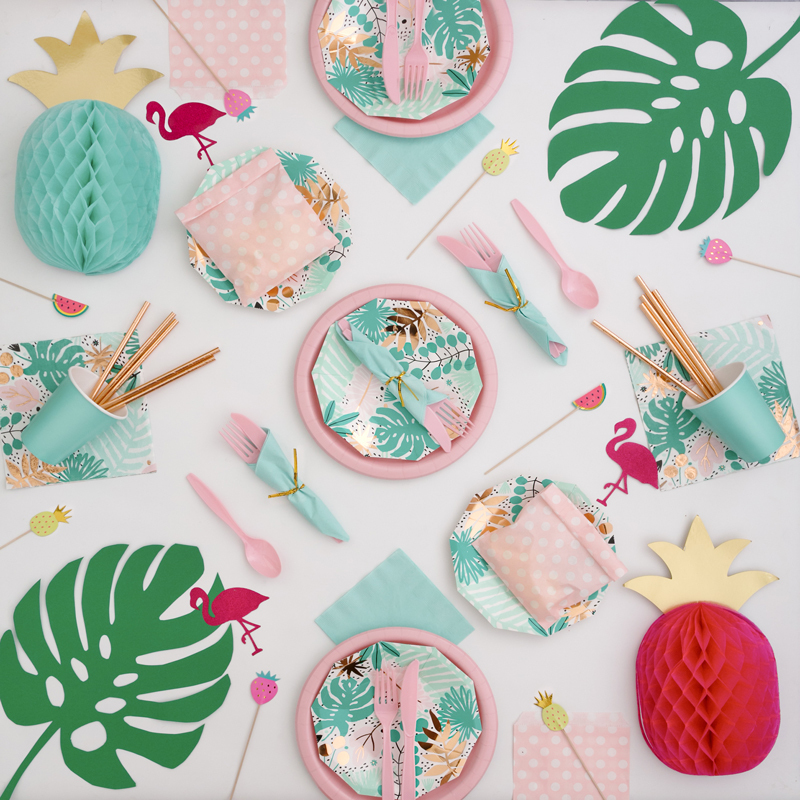 Using inexpensive paper cut outs to complement a Tropicana themed party kit. A lot of vinyl and paper backdrops are stored rolled up so it is important to start flattening them out prior to your shoot so that they are nice and flat before you start. This is also a good time to do an equipment check and make sure that your camera batteries are charged and that your memory cards have enough room to complete the shoot. There is nothing worse than being in the middle of a set and have to stop to recharge or back up your shots. Before you start the shoot you should get everything you are going to need out and ready so that you can make the most of your time on set. With many of us relying on natural light you may not have long in your well-lit area of choice so making your all your items are out and ready to be photographed is vital to ensure all of your shots have consistent lighting. With four different Party Kits to shoot it was extra important for Jinny to have everything out of the box and ready to go. You can see in the images above how she grouped all of the kits with the appropriate props ready to be shot. Below is the finished shots with a mix of Party Kit items supplied by the client and props that Jinny sourced or created herself - it's the perfect way to show potential party planners how good their event could look! Now that everything is all organised and ready to roll all you have to do is get creative and have fun! To get the most out of your shoot time make sure you have eaten and are well rested - unfortunately you will need to save some of your energy for cleaning up and editing your photos. How much work do you put into your styled photo shoots? Are you the type of person who likes to plan each shot out in detail or do you like to wing it and create as you go? Let us know how you like to work in the comments below.